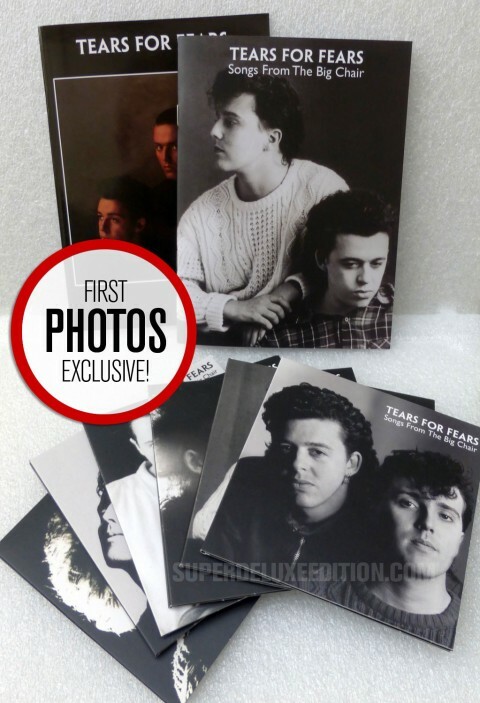 Out today is the Tears For Fears Songs From The Big Chair six-disc super deluxe edition box set (along with other formats). Especially for SDE readers, here is an exclusive photo gallery to give you a feel for this set. Each disc is packaged in a gatefold card wallet and period artwork and logos are present and correct. The box comes with a 28-page replica souvenir tour programme and a 32-page booklet with new interviews with the band and a full guide to the bonus tracks. This set comes with two DVDs one of which contains promo videos, Top Of The Pops appearances, the Scenes From The Big Chair documentary and the other (audio only) with three versions of the album on hi-res audio (original mix, 2014 stereo mix and 5.1 surround mix). More details on the reissue here. Can anyone tell me, is this box (which I have) the same size/dimensions as The Hurting box? Seems the Massey Hall live recordings of “Memories Fade”, “Broken/Head Over Heals/Broken” and “The Working Hour” are listed incorrectly (I got a UK Amazon edition as a gift for Christmas…..) Thoughts? Yes, that is true. In the booklet the titles are in correct sequence but the lengths are off. Certainly Broken wasn’t taken from the same day but I beleive that version of “Shout” and “Working Hour” were taken from the same day of “Scenes” but anyway I hope that Paul might confirm that and also if there is the full concert available for a future release dvd. We’re looking forward to hearing from you Paul! Paul, did the Working Hour (Live Massey Hall) and Shout (Live in Massey hall) were taken from the same day of versions of the Scenes From the Big Chair video? By the way, do you think is there any possibility for a future release of the full concert “Live in Massey Hall 85” on DVD? One thing’s for sure – the mixing of the Massey Hall tracks on the DVD and on the CD is drastically different. The guitar solo in ‘Broken’ is inaudible on the DVD but clearly there on the CD. Have to agree with Simon P and earlier commentators that the DVD is a tad disappointing, given the care and attention which has obviously been lavished on the audio content. In addition to the aspect ratio authoring issue on all of the TOTP performances (which is pretty unforgivable) some of the promos definitely don’t look like they have been taken from the best available source: several of them look like second or even third generation video copies and are very ‘soft’ with washed out colour, and there is also some very noticeable dropout at the start of, and a very bad tape stretch mark halfway through, the ‘Shout’ video. A good box set, I have to say. Disc 4 is my favourite, as the rest of the CD content just seems so familiar, but it’s good to have it all in one place at last. I have to say that the DVD with the videos on is pretty disappointing, as it’s like watching an old, worn out VHS tape! 5.1 disc was an interesting listen, but I didn’t seem to be able to select a track on it whilst listening to it. I had a menu that had a tracklisting with a box around Shout, but that box couldn’t be moved to select any other track. An intentional ploy to make you listen to the whole thing perhaps? Hmm… navigation should work okay on that DVD. You can try just pressing the ‘next’ arrow on your remote which should move you on to the next track. Reading the “no masters could be found” explanation here, and reading it so much lately with reissues. This is frustrating. For a RECORD COMPANY, you’d hope that they’d, you know, take care of their master tapes. Did they really take so little interest in preserving them at the time because they never expected 30th anniversary box sets or are/were all labels so ephemerally-minded with their “product”? I do agree, although when you’re talking about a promo edit of a non-album single that was never released commercially, it wasn’t exactly a major surprise when they couldn’t find it. I was expecting them not to be able to locate the ‘video version’ of Mothers Talk too, since that has never been on anything, but was pleasantly surprised when it was located! so my vinyl for ‘Songs From The Big’ chair has landed. Not what I expected. Was it not advertised as the 2014 mix with a blueish sleeve? instead i get a ‘back to Black 180gram regular reissue. I notice on the Universal site it is no longer been advertised. has there been a screw up? shall the ‘blue’ version ever appear? Anyone else with the same issue? Jan, a few people have had this issue. I’m assuming you ordered from the Universal store…? I had a word with Universal and there is still stock and they should be able to sort this out. The email address is storesupport@umusic.com. Don’t let them fob you off. There is still stock. Let me know how you get on. The US Edit of Shout is available digitally on some compilations . Is that true, as I still see that you can order them from Amazon and this is a year later now, so are those just stock of stuff that has not sold yet or did they change their mind and repress and make some more and if they repressed does it have a fix for the problem with song audio glitch at 2:25 in “Ideas as Opiates”? Curious do you know how many of these boxsets that they made and did they do a similar thing with SFTBC as far as make only so many boxsets? How is the sound of the Dvd in the Hurting boxset, did they do a pretty good job as I was looking at youtube of it and some of the video editing for this look pretty distracting as I just like seeing the band without to may crazy edits and this is over the top with goofy graphics that they did back then. Great work on your site, it is now one of my daily go to music sites to checkout on the net. Don’t think they repressed The Hurting box so whatever stock is floating around out there is it. Sorry not sure exactly how many boxes (for either release) have been made. So Paul, are there vinyl rips as is being commented on many forums? Yes a few – they are clearly mentioned in the booklet. The promo edit of The Way You Are is one, and the US Edit of Shout is another and a few of the Massey Hall tracks. Simply because no masters could be found. A fantastic box set and amazing value for money, at least from Amazon UK. Unfortunately the discs had damaged the back of the inner tray (in transit I presume) on my set putting a large tear in it. No biggie and I received a replacement set from Amazon the following day. I have to say that Amazon offers a great service in that respect as I also had to return two of my Super Deluxe Led Zeppelin boxes and replacements were also sent out the same day. Now I can get on with enjoying the content; I was very impressed with the remaster of the original album which I played in the car yesterday. Thanks Keith – happy you’re enjoying the set! Great box set. Surround sound is well balanced. Is there any reason why The Hurting was never given the surround treatment? I think it was probably just budgetary. Unlike Songs From The Big Chair is wasn’t a big global smash, so perhaps Universal didn’t think the spend was justified. I don’t know that for sure, but a best guess. That doesn’t bode well for The Seeds of Love…THE 5.1 candidate in TFF’s catalog! To be fair, The Hurting wouldn’t profit that much from a 5.1 mix since there’s not that much going on arrangement-wise. Now for “Everyone Wants to Run the World” to come out as a digital bonus track! Fantastic box set,just working my way through now. Wish all deluxe editions could be as comprehensive. Would love The Human League back catalogue to be treated with such respect…..dream on I think. Thanks Edward, glad you liked it. I enjoyed writing that guide to the bonus tracks! I did the interviews with the band too, which was also a privilege and pleasure. Thanks both! I’ve sorted it now ! I could well be wrong, but I thought iTunes populated track titles from its proprietary database that fans/purchasers of CDs can upload to, rather than the info being contained in the CD itself? It’s fantastic value for money- looks good and sounds great! Thanks. What Gareth says is correct, that info isn’t encoded in the CDs, it’s fan-uploaded info. I have the 2cd set. Noticed some vinyl transfers (The Way You Are/Shout (Radio Edit) and Head Over Heels (Radio Version) is in mono. Yikes! I’d be very interested to know if this is the case with other copies, and if it was an oversight. Vinyl transfers should always be flagged upfront, before release. Just so we know what to expect, and if we still want to purchase. Any chance we can lean on the label to publish some hi-res jpg files of the individual sleeves? As a keen iTunes curator, I’d love everything to be ‘just so’ in my TFF section. With you on that one – spent ages looking for decent pictures to use when I ripped them to iTunes for listening on my iPod Classic. Check out fanart tv – There are images there for the individual disc covers as well as The Hurting covers. I find it a very useful site for album covers for iTunes. The images are all 1000×1000 so I just resize the images to 600×600 for iTunes. Mine is on the way……great review Julian! Thanks to Paul at SDE for getting involved with the record companies and making sure the fans get a great value for a comprehensive product! No biggie to me, have all the originals on vinyl as well as digital transfers from the originals, I’ll love the box as a collector. Tv appearances play fine now I’ve cleaned the disc. Please accept my apologies. Julian, I can’t read your single massive paragraph, it hurts my eyes. It’s a great looking boxset but is anyone able to play the tv appearances option on the DVD? If I select that option it just stops the DVD from playing. It’s fine for the documentary and videos. Also a bit of shame regarding some of the ratio settings used for the videos. What aspect ratio are the videos in? Surely should be 4:3? I was watching the remainder of the DVD last night – great to see The Way You Are at last. I was always disappointed by it’s non-inclusion on the original best-of LP/CD after it had been shown in the booklet for the Tears Roll Down single that preceded the album. But Paul, surely the mis-match of ratios on the TOTP performances can’t be right – all but two or three of the clips are clearly squashed height-wise. Has there been an authoring/transfer fault? The only thing that mars an otherwise value-packed re-issue. The majority of the videos have aspect ratio issues. Most are completely surrounded by black bars, some promotion and I believe all of the TOTP videos have this issue. Very surprised as I think my Tears Roll Down DVD is much better quality overall. Other than that, a beautiful set. Wow what an in depth critique Julian. Tells you everything you need to know. Shame about the very small errors but it’ll not put me off buying this when the price is right. I like the stickers tho I like them to be on the actual box it’s a pain as I have to slowly remove them from the cellophane and place it on the box. I’d be annoyed if I bought a brand new box and one of the discs were scratched even if it did play fine. This set looks lovely I have the hurting and the u2 ones glad this one has stayed faithful to that format. It’s a great box, but I also spotted (as above) the mix up on disc 4, (plus my disc 4 is scratched). Being a bit OCD about these things, it is just so annoying that mistakes like this are still happening. I presume there will be new (corrected) sleeves issued for our disc 4s (Paul, can you make this happen). I haven’t listened to all the CDs yet, but I did check the DR of opening track “Shout” on disc 1, and it has a value of 11 which is more than on the 2006 deluxe edition (DR 9) and on the atrocious 1999 reissue (DR 6). So that’s definitely a good thing. I also got the impression that the remastering seems to be not quite as trebly as 2006. What’s bad: “Pharaohs” still has the annoying whistle coming in around 2 min, which was also present on the 2006 deluxe edition. A big bummer is the fact that the previously released Massey Hall tracks were taken from vinyl due to the lack of original masters. I would have much preferred to hear all tracks remixed, because the new remixes sound fantastic (maybe a bit dry, but very good still). Especially the fabulous Broken/HOH performance is somewhat compromised by distortion. So count me in with those who’d buy a standalone release of a remixed/restored Massey Hall CD/DVD in a heartbeat. Speaking about Broken/Head over Heels/Broken, I guess I am the nuttiest TFF fan ever because no one else – not even Chris Hughes – ever mentions that the live reprise of Broken probably comes from the Hammersmith performance found on “In My Mind’s Eye”! To be fair, it should be obvious – the band records a concert for a VHS release and then needs a live recording for the album, hmmm…what are they gonna do? The other interesting fact about the medley is that the reprise in the Preacher Mix is not really a unique studio version, but just a remix of the first part cleverly spliced together from passages that all appear in the original album version of Broken. The missing staccato at the end gave me the cue; if they had properly recorded the second part of the song in the studio, they surely wouldn’t have left the end part out, would they? The reprint tour programme is a thing of beauty. This may sound odd (since the programme is 30 years old), but Nicky Holland looks/looked absolutely gorgeous! I’d love to hear her part of the story for a reissue of The Seeds of Love. Love the fact that the video DVD is not just a straight reprint of the 2006 DVD without “California” but actually adds the videos and TV appearances. Speaking of TV appearances, some of them look a bit odd ratio-wise. Haven’t checked out the DVD-A yet really, although I did notice something already: Not to knock on Steven, but the crossfade between I Believe and Broken seems to be missing. All in all, the set is the ultimate SFTBC experience and includes so many rarities (I’ll still have to listen to) that the gold-coloured sticker is well-deserved (hm, The Hurting was silver, SFTBC was gold…wonder what comes next? Red, blue or green for SOL?). Price is almost ridiculously low for the wealth of content! But does that mean that the 2006 deluxe edition is now superfluous? The answer is: NO! If just for two facts – 1) The Alternate US Remix of Mothers Talk had a four-second percussion intro that is missing here (yeah, laugh at me! I immediately noticed it) and 2) I will always cherish the final passage of Curt’s interview in the 2006 booklet where he talks about the respect TFF got from fellow musicians. Are you pulling my leg or what? This is ridiculous. For once, I never said I was free of typing mistakes. Also, I quickly wrote this comment in a few minutes – not intended it to be printed in a collector’s box set!! Mine arrived today from Amazon. Wow. If only all ‘great’ albums would be re-issued this way. This is obviously the ultimate to end all ultimates as we tend to get a little peed off with the same albums being re-released every few years. Now this totally complete maybe it could be template for other artists to follow suit. Luver-ley!!! For me, what lets this down is that it was a badly designed LP to start with. Drab, with bad typography and with added mullet hairstyles! But that aside, it’s a packed box set. Mine arrived before Roland’s ! the in depth interviews & track by track liner notes, remixes & 5.1. Haha yes, saw that on twitter! Glad you’re happy with the set Mark. Let’s not dock points from a 30th anniversary box set because of 80’s mullets! Received mine today. Superb package. Another excellent example in how to do these super deluxe editions properly. If only Jimmy Page took note for the Led Zep boxes. Mine shipped from Amazon UK this weekend too, but on my account it says that I should expect delivery (in Connecticut) on December 1st! Hope that’s an error, I can’t wait that long! This looks gorgeous. Mine shipped from amazon.uk over the weekend, so I’m hoping to have it here in Colorado by the end of this week! “DVD ‘Scenes form The Big Chair’ with TV appearances and promotional videos”. No mention of 5.1 mixes or even the new 2014 stereo mix! (and yes, it actually says “form”). I had thought it would have been nice to use the different colored logo variants on the discs themselves, so I am excited to see that the different logos do indeed make an appearance on the backs of all of the card sleeves. Happiness! I’m guessing these boxes are roughly the same size as Universal’s The Unforgettable Fire and The Joshua Tree boxes, which are also two very delightful boxes! Currently £11 cheaper through the German Amazon site! Stunning. I want the same for The Seeds Of Love, period!